There is nothing I hate more than soap scum. We recently remodeled our bathroom and updated our old cinderella tub into a fully functional tub/shower combination surrounded by glass tile. While I absolutely adore how the project turned out, I’m a little daunted when it comes to cleaning. We had rarely used that tub prior to the remodel, so I never knew how much soap scum would start to accrue once we started using the tub daily. For a while, I was buying a natural shower cleaner which worked wonderfully for the tub, but not so wonderfully for our budget. Plus, it contained a very strong fragrance which lingered for quite some time. The fragrance bothered me so much that I had to open a window after using it. To save our budget and my sense of smell, I decided that I would make a homemade shower cleaner that was able to cut through soap scum. My version is very simple and uses ingredients found in our home. I chose to use white vinegar as the base of the spray because it works wonders as a natural cleaner. 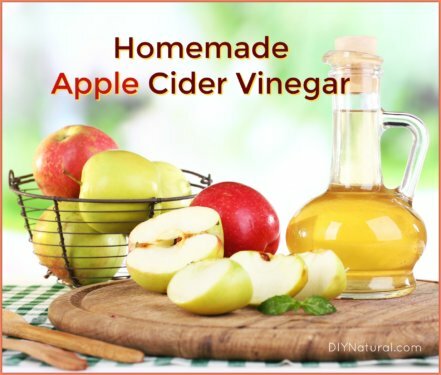 Check out this post on other ways to use white vinegar for cleaning. It is very effective at cleaning the shower as well and rinses away quite easily. Next, I added some fragrance free natural dish soap. I like this one because it cuts through the grease and soap scum very easily. Plus, no fragrance! It mixes well with the vinegar. Finally, I chose two great cleaning essential oils: tea tree essential oil and eucalyptus essential oil. Both oils have been used to combat fungus and bacteria. They also help prevent mold and mildew in the shower. Plus, these essential oils smell super fresh. I use them in many of my home cleaning products because of their effectiveness at combating germs and keeping things clean. The recipe will work just as well to combat soap scum and residue without the essential oils, but it won’t be as effective at keeping away mold, mildew, and fungus. However, if you are just looking for an everyday maintenance cleaner, you can omit the essential oils. 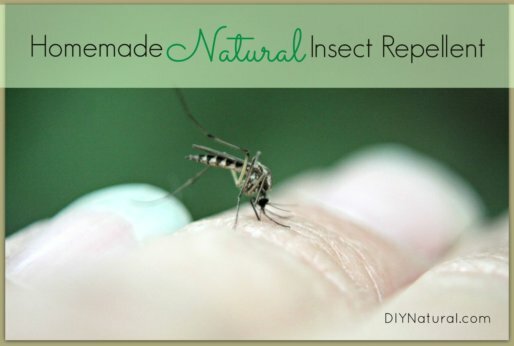 *I prefer to use this recipe in a colored spray bottle because it includes essential oils. In a spray bottle (8 oz or larger), combine white vinegar and dish soap. Swirl to combine. Spray generously in tub and on tile. Wipe with a clean rag. I also rinse the tub down with water after using the spray, just to make sure there is no cleaner residue, before giving my little one a bath. Tea tree and eucalyptus are wonderful cleaners, but they can be irritating to the skin. Definitely an optional rinse, but that’s what works best for us. That’s it! Just an easy DIY tub and tile cleaner that will help keep your shower sparkling and soap scum free. 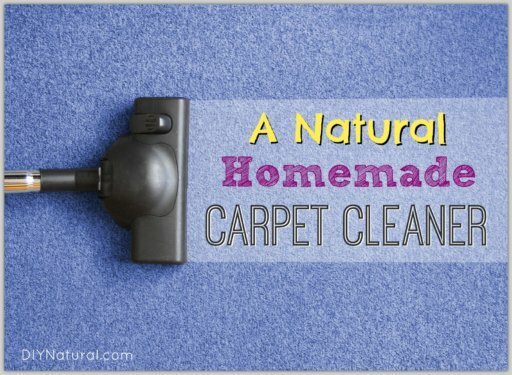 Interested in more DIY cleaners? Yay another Norwex fan!!! Please ladies and gents check out Norwex! They are super environment friendly! They offer cleaning rags that are intertwined with silver and it naturally kills gems and bacteria v with out using ANY CLEANERS!! Yes you heard me-you wet the cloth and clean and it totally disinfects! I went to a Norwex party and did not believe this could work…the lady pulled out a test strip to show the bacteria growing on the counter before cleaned. Then she wet the cloth, wiped down the counter again and tested…totally clean, no ebbie-freebies!! She also did a demonstration of their window cloth removing a smear of BUTTER off a window with no mess or streaks by just using water to wet the cloth! Seriously my natural friends check them out…oh and no I don’t work for them! I just really love their products. They are a bit pricey but you don’t have to buy any cleaners and I bought mine two years ago and they still work great! Ok I hate auto spell!! I’m so sorry for the typos, but I think you can figure out what I was trying to say. If you have any questions just ask…again sorry. Not to turn this into a Norwex dialogue, but I don’t think the consultant would have said that Norwex microfiber kills germs and bacteria. The BacLock (microsilver woven into the cloths) is for self-purification purposes only; it does not disinfect surfaces. The cloths CAN REMOVE up to 99% of bacteria from surfaces when following the directions properly, which is still awesome, but I just wanted to make sure the info here was correct :). When you rinse your cloths then in hot water and allow to dry for 24 hours, the BacLock will inhibit bacterial odor, mold and/or mildew growth IN the cloth. Norwex is still totally awesome and saves me from mixing up a bunch of natural cleaners, but I wanted to make sure to share this corrected info :). Does this cleaner work on acrylic tubs? Yes, Patricia! We have been using this on our acrylic tub and it works great! I am gong to try this as I battle mold and mildew daily, so,, with a husb1 and that has congestive heart failure, keeping showing clean is a must! Thank you. Water, sodium lauryl sulfate (plant-derived cleaning agent), glycerin (plant-derived foam stabilizer), lauramine oxide (plant-based cleaning agent), caprylyl/myristyl glucoside (plant-derived cleaning agent), magnesium chloride (mineral-based viscosity modifier), citric acid (plant-derived pH adjuster), and benzisothiazolinone and methylisothiazolinone (synthetic preservatives). Lavender Floral & Mint: Cananga odorata (ylang ylang) flower oil, citrus aurantifolia (lime) oil, citrus aurantium dulcis (orange) oil, lavandula hybrida (lavandin) oil, mentha piperita (peppermint) oil, and mentha viridis (spearmint) leaf oil. Lemongrass & Clementine Zest: Canarium luzonicum (elemi) gum nonvolatiles, citrus aurantium bergamia (bergamot) fruit oil, citrus aurantium dulcis (orange) oil, citrus nobilis (mandarin orange) peel oil, cymbopogon schoenanthus (lemongrass) oil, and tangelo oil. Fresh Citrus & Ginger: Canarium luzonicum (elemi) gum nonvolatiles, cedrol, cinnamomum zeylanicum (cinnamon) bark extract, citrus aurantifolia (lime) oil, citrus aurantium amara (bitter orange) oil, citrus aurantium bergamia (bergamot) fruit oil, citrus aurantium dulcis (orange) oil, citrus limon (lemon) peel oil, coriandrum sativum (coriander) fruit oil, elettaria cardamomum (cardamom) seed oil, eugenia caryophyllus (clove) leaf oil, myristica fragrans (nutmeg) kernel oil, pelargonium graveolens (geranium) flower oil, and zingiber officinale (ginger) root oil. Thanks so much, Shari! Actually, dish soap works best because it helps loosen up the soap scum. Castile soap may work, but I am thinking it will not work as well as dish soap. Thank you Katie, I just wondered since my dish soap from scratch has castile soap in it. Blessings! Castile soap and vingegar don’t mix! Thank you Jenn! That helps answer the question. I think its best to stick with dish soap then. Why use the liquid soap with no scent? 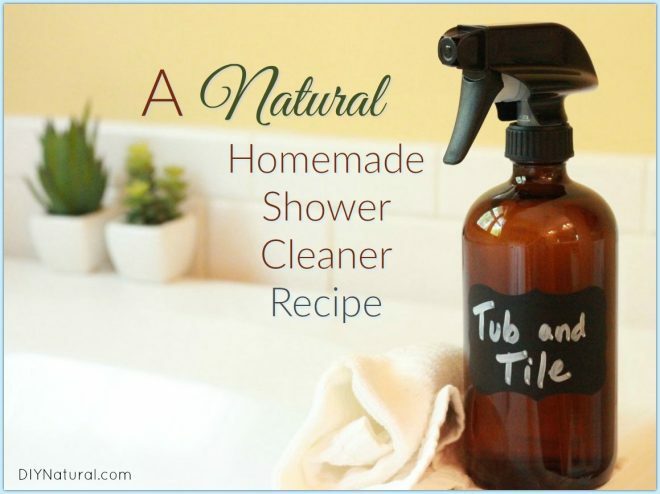 I use a Lavender dish soap that is natural, could I use that?? I always purchase unscented soap, but yes a natural lavender dish soap would work just as well! Thank you! I’ve stayed away from using eucalyptus around the kids because I’ve heard it’s no good for children under 5. Do you have an alternative oil, or can the spray work without it? Salima – Eucalyptus in this recipe is totally safe for use around children because it is wiped away (and you can rinse your tub out like I do before bathtime). Eucalyptus essential oil not recommended around the face of children due to its chemical makeup affecting breathing/CNS, but it is safe to use in the home. Just don’t spray directly on a child and you’ll be fine. I definitely am going to try this! With 3 bathrooms, that’s a lot of cleaning, and I need all of the NATURAL help I can get. I gave up the noxious cleaners long ago, but haven’t found an acceptable replacement. Thank you so much for sharing your recipe! I tried this recipe, and it cleaned my grimiest shower really well. Just one problem-the fumes were quite powerful. It was probably due to the fact that I used a bargain brand, scented dish soap instead of the recommended one. I would caution people to be careful and not do what I did. I am making liquid soap (from this site) and will use that the next time, as it makes a great dish soap.